Background: It remains unknown whether blockade of c-Met signaling and epidermal growth factor receptor signaling is effective in suppressing the growth of human colorectal cancer (CRC) cells. In this study, we investigated the effects of the c-Met inhibitor PHA-665752 alone and in combination with cetuximab on the growth of human CRC cells in vitro and in mouse xenografts. Methods: Human CRC cell lines (Caco2, HCT-116, and HT-29) and mice bearing HCT-116 xenografts were treated with cetuximab in the absence or presence of PHA-665752. Cell viability and apoptosis were examined using the MTT and TUNEL assays, respectively. Vimentin was measured by immunohistochemistry as a marker for epithelial-to-mesenchymal transition. Western blotting was used to determine signaling protein expression levels. Results: The MTT assay showed that the growth of Caco2, HCT-116, and HT-29 cells was inhibited by PHA-665752 in a dose-dependent manner, but only Caco2 cell growth was suppressed by cetuximab. Combination treatment with PHA-665752 and cetuximab inhibited the proliferation of Caco2 cells and RAS mutant CRC cell lines. However, relative to the PHA-665752-alone treatment group, HT-29 cells with a BRAF mutation showed no noticeable effect. 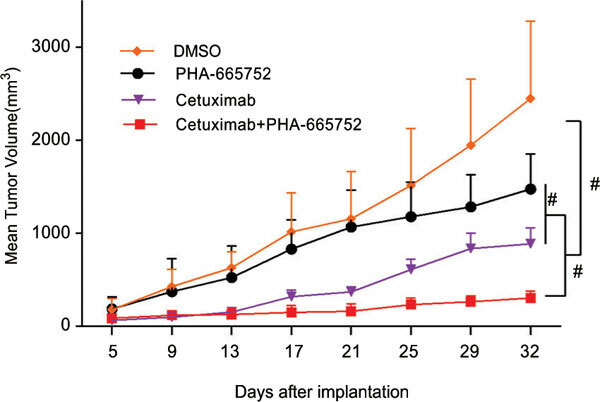 The mean tumor volume in mice treated with cetuximab in combination with PHA-665752 was significantly smaller than that in the mice treated with only cetuximab (P = 0.033) or PHA-665752 (P < 0.01). Similarly, the expression of vimentin in the mice treated with PHA-665752 in combination with cetuximab was significantly lower than that in the mice treated with cetuximab or PHA-665752 alone (P < 0.05 in each case). TUNEL assays revealed that treatment with PHA-665752 in combination with cetuximab markedly increased CRC cell apoptosis. Western blotting analysis of signaling protein expression showed that PHA- 665752 inhibited Met phosphorylation (P < 0.05). In addition, treatment with cetuximab alone or in combination with PHA-665752 effectively inhibited EGFR phosphorylation (P < 0.05). Conclusion: Combination treatment with PHA-665752 and cetuximab suppressed in vitro and in vivo CRC cell growth more than treatment with either agent alone did. Keywords: Colorectal cancer, cetuximab, RAS, BRAF, c-Met, CRC cell lines. Keywords:Colorectal cancer, cetuximab, RAS, BRAF, c-Met, CRC cell lines. Abstract:Background: It remains unknown whether blockade of c-Met signaling and epidermal growth factor receptor signaling is effective in suppressing the growth of human colorectal cancer (CRC) cells. In this study, we investigated the effects of the c-Met inhibitor PHA-665752 alone and in combination with cetuximab on the growth of human CRC cells in vitro and in mouse xenografts.